The Larson Electronics EPL-TX-3KVA-240-120X10 explosion proof temporary power distribution system converts 240V to 120V AC electrical current. This portable transformer provides operators the ability to safely tap into commonly found 240V and distribute 120V within explosion proof environments. This wheeled power distribution system allows operators to safely operate up to 3,000 watts of lighting and electrical equipment within Class 1 Division 1 zones. The EPL-TX-3KVA-240-120X10 portable explosion proof power distribution system is designed to provide operators using 120V equipment in hazardous locations with a means to operate off 240V outside the hazardous environment. 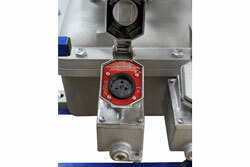 This unit includes ten explosion proof twist lock receptacles rated at 20 amps each. This compact power distribution system is designed for portability and convenience as well as durability and is mounted to a wheeled, non-sparking aluminum frame for added protection. Operators provide 240V from inside or outside the hazardous location to the 3,000 watt transformer via the provided 25` SOOW line in SOOW cable terminated in an explosion proof plug to the encapsulated transformer. The explosion proof transformer converts common 240V to 120V for use with explosion proof electrical equipment in Class rated environments. The output side is equipped with ten 2023, Class 1 & 2, Divisions 1 & 2 receptacles designed to accept twist lock plugs like our EPP-15A and EPP-20A explosion proof plugs. The class rated transformer and distribution assembly is mounted onto a rugged cart style framed constructed of non-sparking aluminum and powder coated for added corrosion resistance. 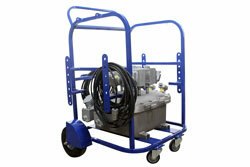 Mobility is provided by rotating front casters and run flat rear tires, allowing operators to wheel this temporary transformer from betweein job sites within the hazardous environment.